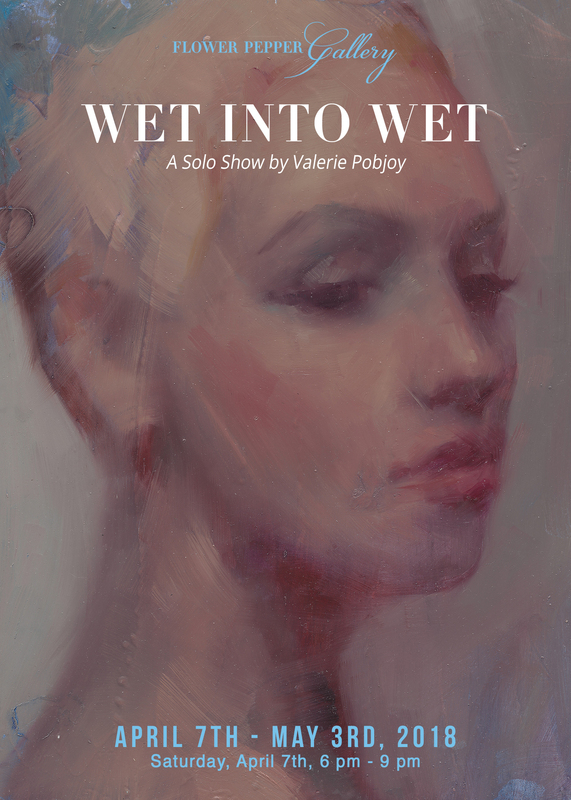 On Saturday, April 7th, Flower Pepper Gallery is pleased to present Wet Into Wet, a solo show by Valerie Pobjoy. This is Valerie’s second solo show with the gallery in addition to her participation in numerous group exhibitions. However, this collection of works in particular focuses on a specific method of her painting that is rarely seen in our modern era at such a high level. Portraits throughout history have been described as both a work of fact and fiction. While they are based on real people, the success of them lies in the artist’s ability to see past the façade and capture humanity on a deeper level. “‘Alla prima’ (Italian for ‘at first’) is an oil painting technique, where each layer of the painting is still wet as the next layer is applied. This process requires a fast way of working, since the reference is a live model and there is a limited amount of time. This technique came into popularity in the Impressionist movement. This dedication and philosophy has resulted in work that is brimming with life and empathy. The rich layers of color pays tribute to the old masters but Valerie has proven she is not afraid to take the style further. Most portraiture in the past would selectively show only what the subject would want seen. It would elevate the positive and romanticize the rest to the point where people often resembled idealized gods and goddesses more then regular people. Valerie’s work is so compelling because she paints with immense honestly and elevates it all. No emotion or subject matter is considered too lowly or unappealing and with her brush, it is all revealed to be beautiful. Each muse is unique and given the immense respect of being a complete, unabbreviated human being. They are not merely subjects to be viewed, but they represent different attributes in all of us and reveal the complex beauty and emotion hidden within. Many thanks to Supersonic Art for featuring the exhibition! Click here for the feature.